The third part of Fighting Insider Whizzer series teaches your the Counter to Leg Throw Off the Whizzer. Still on the Whizzer, today’s episode of Fighting Insider’s MMA technique teaches you the Counter to Leg Throw Off the Whizzer. 1. The man on the left obviously doesn’t have a firm overhook on his opponent and wrist control on the far arm. 2. Next, he steps his leg in to attempt and start a throw. 3. 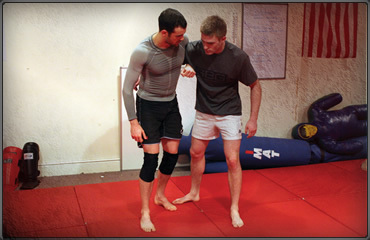 Then his opponent starts to counter by dropping his hips forward, stopping the former’s leg. 4. He then takes the body lock and drops his hips further. 5. He was able to lift the guy on the left. 6. Then he drives to his right by using his head, before the lifted fighter gets on the mat. 7. Followed a strong land control position. More Whizzer techniques are sure to come, so just keep it posted here are Fighting Insider.